Thank you for donating $1,000.00 to purchase items for the ‘Baskets of Hope‘ program.. Okay, here I do… I had a vision about 2 weeks ago at Texas Roadhouse Peoria. I asked my managing partner if I can have 5 minutes of his time to present him with an idea I had. He gave me those 5 minutes. My two and a half year battle with cancer has been long and it’s not over yet. I met a lady named Gina sheets that is the marketing manager for Banner Lakes imaging that has the only Digital Mammography unit in the West Valley. She told me that they offer a woman in the West Valley with no insurance a 3d digital mammogram for $112.00… but I thought, wow! 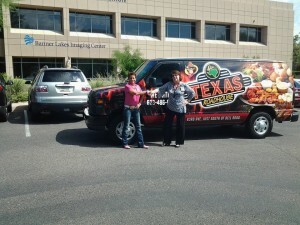 If they don’t have insurance how can I afford the hundred and twelve dollars and I thought wouldn’t it be amazing if we came up with a project for the month of October to raise funds so Texas Roadhouse Peoria could pay for these women in the West Valley and they would receive a 3d digital mammogram courtesy of Texas Roadhouse. Please come to our location and help support my vision. If my vision and Texas Roadhouse can just catch the cancer early enough a woman does not have to go through the chemo or radiation. If we can change at least one woman’s life by finding the cancer early enough, then my vision is complete. What I need is your help to do this. Please come visit us at Texas Roadhouse Peoria the month of October and show your support to all the women that have had or are going through or diagnosed with breast cancer. 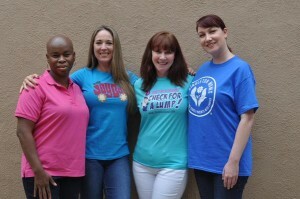 Help us beat this horrible disease. 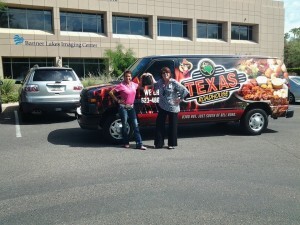 I also have one more project going that month at Texas Roadhouse Peoria. I am in the process of making a HOPE BASKET. You ask, what is a HOPE BASKET? This is a basket donated with things from the community, movie passes, baseball tickets, food, cards I made, and a blanket. I’m hoping to receive a quilt. Anything that you think someone might need. 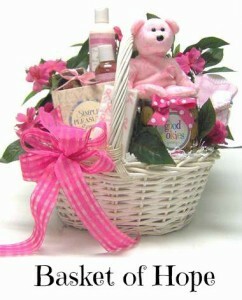 This basket will be given to a woman who is currently going through cancer and treatment.